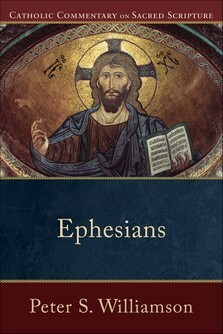 The scholarly consensus on the authorship of Ephesians is that Paul did not write it. I think this is mistaken and I find the arguments in favor of pseudonymity to be seriously unconvincing. It isn’t easy, however, to find sane discussions of this issue. Peter Williamson contributed the volume on Ephesians for the Catholic Commentary on Sacred Scripture (Baker Academic). It’s an excellent commentary–clear, concise, thorough, and theologically compelling. His discussion of the letter’s authorship in the introduction is brief but he points readers to a longer online discussion. Check it out. It’s one of the better discussions I’ve found. Thanks for this discussion and the link. Our pastor has been preaching on Ephesians and so I have been doing some outside reading and had encountered this and wondered. From my lay viewpoint, however, I also found it frustrating that the conservative evangelical church tends to just ignore all of the opposing scholarship too–e.g., if you mentioned that some scholars didn’t believe in Pauline authorship of some NT books and this is something you were interested in you would be run out of church as not believing the Bible. While I accept this might not be something you address from the pulpit, it would be nice to have these discussions at some level. I agree that it is indeed helpful to have sane and reasonable conversations about stuff like this. What’s unfortunate is that many defenses of Pauline authorship are reactionary and question-begging rather than reasonable. It’s sad but true that there haven’t (in the past, anyway) been resources available to many lay Christians to dig into these more advanced issues. But they’re there if you do some digging!